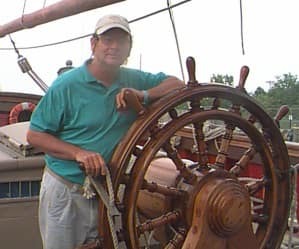 Two crew members of the Nova Scotia-built replica vessel were missing after abandoning ship off the coast of North Carolina in high seas brought on by Hurricane Sandy. 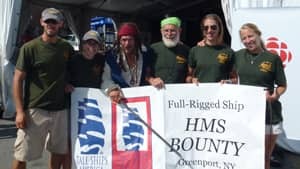 Claudia McCann, whose husband Robin Walbridge is the captain of the Bounty, told CBC News her husband was one of the two missing crew members. Crew members of HMS Bounty pose during the Tall Ships Festival in Halifax in July. (CBC)“We had a C-130 on scene that was running out of fuel and experiencing a little crew fatigue, so we dispatched another C-130 to arrive on scene and relieve them,” said Petty Officer 1st Class Jordan Campbell. Robin Walbridge, captain of HMS Bounty, is missing at sea. (HMS Bounty website)“He was just trying to avoid it, skirt it. Skirt through it, skirt around it,” McCann said earlier on Monday. 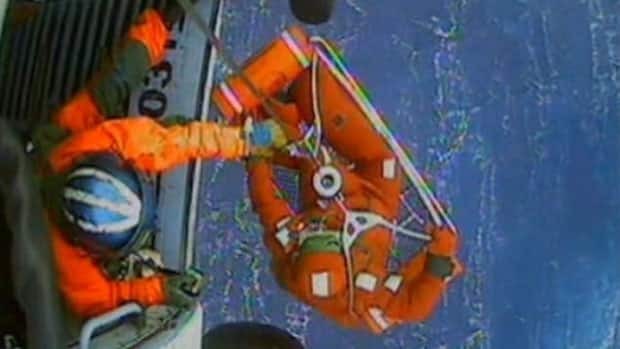 CBC News spoke to Claudene Christian, whose daughter was a crew member on the Bounty, Monday morning. She said her daughter Claudene had contacted her before heading out on her journey. “She says, ‘We’re heading out and I just wanted to tell you and dad that I love you.’ And I said, ‘What are you saying that for?’ And she said, ‘Just in case something happens,'” Christian said in a phone interview from Oklahoma.